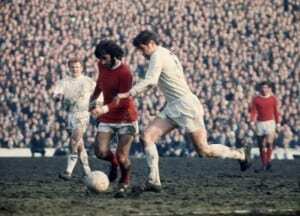 Norman Hunter was an integral part of Don Revie’s famous Leeds United side of the 1970s. A tough tackling centre-half, he earned the nickname of ‘Bites Yer Legs.’ The phrase first appeared on a fan-made banner but quickly became synonymous with a player seen as the 'enforcer' of a side already filled with uncompromising characters. In the course of a 20 year long career, he made a total of 679 League appearances for Leeds, Bristol City and Barnsley. Joining Leeds United as a 16 year old, Hunter was one of several young players who helped Don Revie transform the fortunes of the club. From a struggling Second Division side, Leeds United became a power in both England and Europe between 1964 and 1975, enjoying success and suffering a number of agonising near-misses. In this period Leeds would win the First Division twice and finish runners up five times. In 1972 they won the FA cup for the first time in the club’s history and finished runners up on another three occasions. Leeds and Hunter also won the League Cup once and the Fairs (UEFA) Cup twice, whilst also finishing runners-up in the Cup Winners' Cup and the European Cup. Appearing for England between 1965 and 1974, Hunter was part of the 1966 and 1970 World Cup squads. His total number of 28 caps would have been more, if not for the settled partnership of Jack Charlton and Bobby Moore for much of that period. Although often modest about his own footballing skills, Hunter’s abilities were recognised by fellow players. In 1974 he became the first winner of the Professional Football Association Player’s Player of the Year award. Retiring from playing in 1982, Hunter spent eight years as a manager before working for local radio at Leeds United games.